A graphene transistor exhibiting bistable characteristics in which charge-carrying electrons move at incredible speeds of up to trillions of switches per second has been developed. Graphene has been touted as the wonder material with uses ranging from conductors, transistors, and even as a material for batteries. Graphene is a better conductor for electricity than silicon and conducts heat better than copper. It is almost invisible since it is only one atom thick and is flexible, allowing it to be molded into different shapes. Graphene is also as strong as a diamond. Just like graphene, diamonds are also made up of carbon atoms. Carbon atoms in a diamond are interconnected with four strong atomic bonds. With graphene, the carbon atoms are interconnected in three strong atomic bonds. But unlike diamonds, graphene is not rare. Graphene comes from graphite, the material used for pencil lead. Graphite is actually layers of graphene that are connected together with a weak atomic bond. Graphene can be applied to a substrate like plastic foil, where it can be used in electronic devices that are flexible, energy efficient, and faster than conventional silicon based transistors. 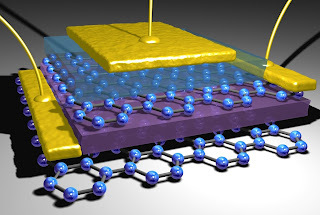 Graphene can transmit ten times more data than silicon. Writing in Nature Communications, the researchers report the first graphene-based transistor with bistable characteristics, which means that the device can spontaneously switch between two electronic states. Such devices are in great demand as emitters of electromagnetic waves in the high-frequency range between radar and infra-red, relevant for applications such as security systems and medical imaging. Bistability is a common phenomenon – a seesaw-like system has two equivalent states and small perturbations can trigger spontaneous switching between them. The way in which charge-carrying electrons in graphene transistors move makes this switching incredibly fast – trillions of switches per second. Wonder material graphene is the world's thinnest, strongest and most conductive material, and has the potential to revolutionise a huge number of diverse applications; from smartphones and ultrafast broadband to drug delivery and computer chips. It was first isolated at The University of Manchester in 2004. The device consists of two layers of graphene separated by an insulating layer of boron nitride just a few atomic layers thick. The electron clouds in each graphene layer can be tuned by applying a small voltage. This can induce the electrons into a state where they move spontaneously at high speed between the layers. Because the insulating layer separating the two graphene sheets is ultra-thin, electrons are able to move through this barrier by 'quantum tunnelling'. This process induces a rapid motion of electrical charge which can lead to the emission of high-frequency electromagnetic waves. These new transistors exhibit the essential signature of a quantum seesaw, called negative differential conductance, whereby the same electrical current flows at two different applied voltages. The next step for researchers is to learn how to optimise the transistor as a detector and emitter. One of the researchers, Professor Laurence Eaves, said: "In addition to its potential in medical imaging and security screening, the graphene devices could also be integrated on a chip with conventional, or other graphene-based, electronic components to provide new architectures and functionality. "For more than 40 years, technology has led to ever-smaller transistors; a tour de force of engineering that has provided us with today's state-of-the-art silicon chips which contain billions of transistors. Scientists are searching for an alternative to silicon-based technology, which is likely to hit the buffers in a few years' time, and graphene may be an answer." "Graphene research is relatively mature but multi-layered devices made of different atomically-thin materials such as graphene were first reported only a year ago. This architecture can bring many more surprises", adds Dr Liam Britnell, University of Manchester, the first author of the paper.